Domino’s is currently delivering a pizza it calls the Smart Slice to more than 3,000 lunchrooms in 38 states, reports the New York Times. Recently, there’s been an onslaught of new federal rules aimed at getting schoolchildren to eat more healthfully. So, companies like Domino’s are making healthier versions of their food to sell in schools. “Smart” Domino’s pies served in school cafeterias contain 51% wheat flour. Domino’s uses a brand called Ultragrain, made by the food giant ConAgra—which looks, tastes, and bakes more like white. To fit the new standards, the Smart Slice has 1/3 less fat in the pepperoni, 1/3 less salt, and cheese with just half the usual fat. The kicker? 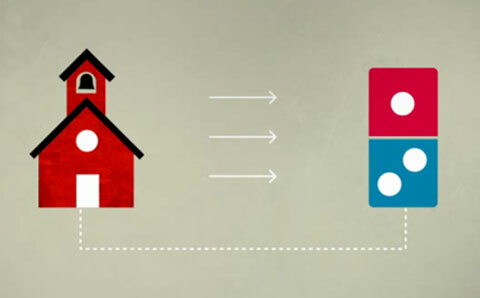 Children leave school loving and thinking about Domino’s—and they don’t know the different between Smart Slices and regular Domino’s. So, they head to their local Domino’s after school and enjoy a full-fat, full-sodium slice made with refined white flour. Big Food wins again.